New World Economic Forum research shows Spain is the healthiest nation, and that diet with extra virgin olive oil at its heart is a significant reason why. The Mediterranean approach to food, significantly plant-based, with premium fresh extra virgin olive oil as a vital constant and so, no wonder, people want this at the heart of their diets too. You can do just that, with Mother’s Garden. Our mission is to bring you the exact same premium, quality, award-winning, fresh extra virgin olive oil as we place at the heart of our farmhouse kitchen table. No compromise. Olive oil and health, olive oil and your heart. Need a top up? Would you like some? Spread the olive oil, spread goodness​. Please share this with your friends, family, neighbours and colleagues. We have new harvest stock ready for immediate delivery to your door or workplace, or to a HUB. Mother’s Garden is much more than just award-winning, premium extra virgin olive oil. The first book about Mother’s Garden, the story of how we found the farm, or how it found us, has been reprinted by Little Brown. A farm, a tree, a life in all honesty. NO GOING BACK – Journey To Mother’s Garden is one family’s search for a different way of living. Travel to our Mediterranean farm with us. Read our story. We are delighted to be the first olive oil to be featured by leading author and olive oil expert Judy Ridgway in her new GREAT OLIVE OIL STORIES. Click here to read her report. Provenance is fundamental, as are freshness and quality, and we are right here, ready to supply you. Just get in touch, or go direct to our shop. HAPPY NEW YEAR one and all, from us here on the farm at Mother’s Garden, a breeze away from the Mediterranean, home of your premium extra virgin olive oil. Here is something new for 2019 – a podcast of Mother’s Garden farm life, a weekly wander across the land and through a host of topics, not least nature and food. It will be very much a local view, intended to give a flavour of this life, this land, but it will also include opinion of global matters, essentially ecology and our collective home, Earth. I think of these podcasts as having the title Where I Stand, as I – we – seek to ground ourselves amid the obsessions of our collective daily lives and the relentless torrent of news, most of it negative. An antidote, if you will, certainly a chance to step away for a moment – about ten minutes once a week – to perhaps get a sense of Mother’s Garden and all it means to us and everyone who has ever been here. So, peace to all. And with hope for health and sustaining fulfilments in 2019 here is the first of the podcasts. If you wish to listen on an iphone/itunes, click here. If you have another phone or want to listen via a computer, click here. Please consider following, and also sharing this. Oh – two further rather important things. 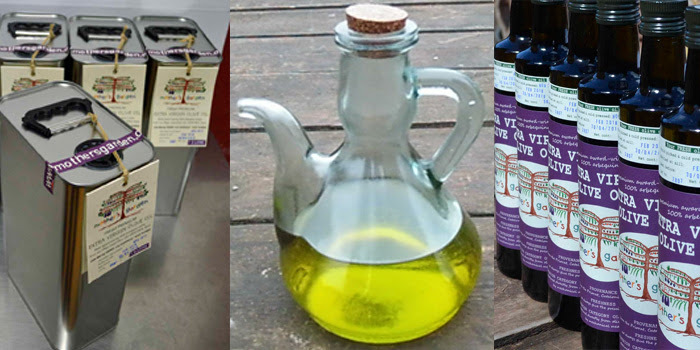 IF YOU HAVE YET TO ORDER NEW HARVEST OLIVE OIL we have stock and it can be with you in a couple of days. Just email us or go to our online shop. AND FEEDBACK – all your thoughts regarding the new olive oil and, indeed, the podcasts are most welcome. We really value you and your opinions. Keep well. Maybe consider a visit to Mother’s Garden this year. YET TO ORDER? NOW IS THE TIME! NEW HARVEST olive oil has now arrived in the UK. Thank you to everyone who has ordered. We are working hard and all orders to date should be delivered within the next few days. Thanks, too, for all the fantastic feedback to date. Yes, it is SO delicious and we are delighted many agree. Give someone a bottle this festive season. – they make perfect gifts. 3 litre tins £27, case of 6x500ml glass bottles £43.50. Flat rate delivery charge of £10.75 for orders under £120. Dipping winter temperatures will mean that the olive oil will thicken, but this will ease at room temperature after a few hours. The cold in no way affects the quality of your premium, super fresh extra virgin olive oil. While continuing to supply 500ml glass bottles in cases of six, for larger volumes we switched from plastic containers to single size 3-litre tins this year, to cut the volume of plastic in the world. We also sought to use high quality, thin tin to vitally reduce waste and weight. This has been a success. But one issue has been the ease with which these tins can dent. We strive to do all we can to protect the tins, but ask for your understanding if they have are not always perfect on arrival. 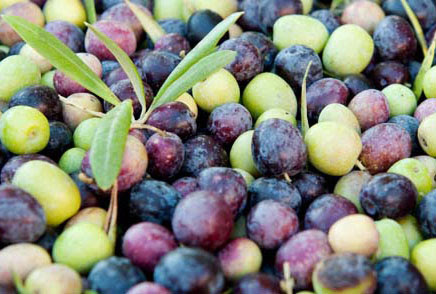 We stress that the fundamental – the quality of the premium olive oil we are supplying to you – is not affected at all. We keep labelling to a minimum for ease of recycling, so please do this! It is all happening! The olives are being picked and the mill is in full swing – it is the annual harvest at Mother’s Garden and throughout our region of the Priorat in Southern Catalunya. We are working hard to get newly pressed olive juice to you as soon as possible. We are taking orders now for December deliveries, so please get back to us as soon as you can. As always, there is limited stock, so first come first served. UNFILTERED OR NOT? (Unfiltered olive oil only available in 3 litre tins). If you want unfiltered we need your order by Sunday evening, November 18th. Unfiltered is even more vibrant and peppery, but because it has fruit particles in it we recommend it is consumed or filtered within three months. Filtered olive oil is slightly softer but also bursting with all the goodness and delicious flavour. We recommend filtered olive oil is consumed within a year of bottling. The aim as always is to deliver to customers before Christmas. We will pull out all the stops to do this but cannot promise (we haven’t failed yet). As you can see above, the pricing is unchanged. No delivery charge for orders of more than £120. Normal flat rate charge is £10.75 currently. We regret this may increase in January. PLEASE CONSIDER, in these uncertain times for all of us, buying more volume and storing it. Buy with friends, family, colleagues, neighbours – see our hubs page. You cut down on transport cost and impact and because the olive juice is so fresh it will store well if kept in a cool place. Hundreds of our valued customers love to receive the new harvest, the zest of freshly pressed Mother’s Garden premium extra virgin olive oil. So, get back to us or go to our online shop. We can supply Europe-wide, but deliveries will take one week longer. If you need a top up right now, we have a few 3 litre tins of our award-winning, delicious olive oil from the last harvest still available. It is still really fruity and beautiful. We have no glass bottles of this currently in stock. We send all good wishes from Mother’s Garden – and please note, we will be opening the cottage for visitors again in 2019. The need for a more plant-based diet such as the Mediterranean tradition is becoming clearer every day, with (we humbly recommend) premium fresh olive oil at the heart of it. Now there is new research regarding cellular ageing. See here for more detail on a new report highlighting how nutritious diets have a lengthening effect on chromosomal structures called telomeres, which help protect against chronic disease. If you are among the many exploring vegan or vegetarian dishes you will find many recipes include the finest olive oil which, if sourced carefully, is loaded with antioxidants and has many health benefits. And it is the juice of a fruit, remember, so the fresher the better – note the beautiful scent and flavour. We at Mother’s Garden here on our Mediterranean farm are very happy to answer any of your questions and, of course, to supply you. But whichever olive juice you use, from whatever country, just be sure you know exactly where it came from, that it is premium quality, and the label tells you when it as pressed. For maximum goodness you need freshness as well as full provenance and premium quality. And we also recommend keeping an eye on the Olive Oil Times for latest news. We are all still learning about this amazing, essential plant food.